By now you’re all aware of the new “Box Toppers” that are being included in booster boxes of Ultimate Masters. Some of them are very good and some of them are Lavaclaw Reaches. Some of them are Modern or Legacy staples and some of them are EDH gold. What I am going to do today is rank all 40 in terms of how much play they get in EDH to see if there are any cards likely to be underestimated by the general public at first. Remember, this is the same general public that thought a $70 Duplicant Invention was a good thing and a $20 Ornithopter Invention was an overpayment. Cards like Mind’s Eye, Duplicant and Solemn Simulacrum don’t get the play they used to and some other cards that people consider staples in “their” formats get a consider able amount of EDH play. Cross-format appeal can juice cards more than people might think and it’s important to know what matters in EDH. Here are all 40 cards, ranked by most EDH play to least, with some notes. No real surprises here. Eternal Witness is a true format staple. Unfortunately, despite its ability to shake off reprints and maintain around $7 retail basically forever, it hasn’t shown much of an ability to have the premium versions go nuts. This is about a 5x multiplier which is great and I expect the box topper to be a lot, but without any real demand in formats outside of EDH and despite the most EDH demand of the 40 cards, I expect this to end up one of the cheaper ones due to the lack of cross-format appeal. That said, one just sold for $250 which is better than quite a few of the cards. I don’t have super high hopes here, though although being “uncommon” doesn’t matter since it has the same rarity as the other box toppers. I’m not sure if there will be more of these judge promos or more box toppers. 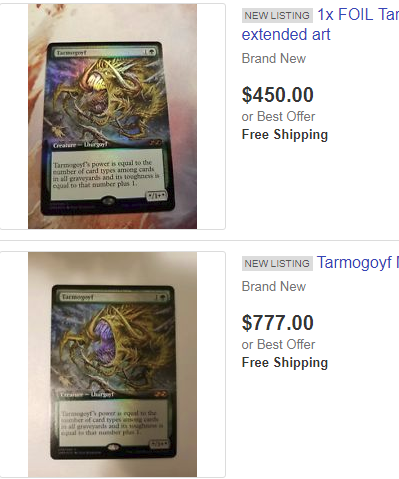 What I do know is that Demonic Tutor has cross-format appeal, the second-most EDH demand, precendent for a nearly $300 promo and it looks like someone listed a UMA boxtopper on eBay for $200 and accepted a lower best offer. That’s good news for anyone who is looking to grab these around $150 when UMA is at peak supply because I don’t think $300 is unreasonable for the UMA box toppers which look way better than the Judge Promo version. There was no Urborg Expedition, which was sort of a surprise, but that means it will be tougher to pin down where the box topper is likely to end up. 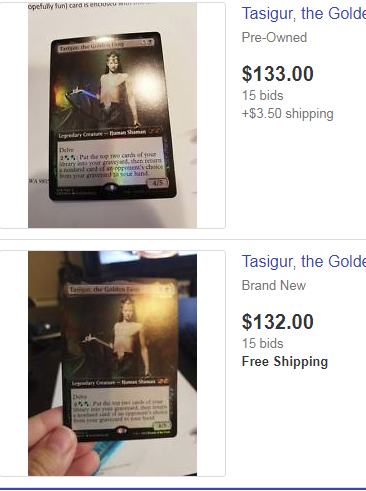 What I do know is that they’re currently going for about $150 and that’s like 5 times what an FTV foil is going for. I think high demand could confound the high supply of FTV foils and give us a price above $100, but I’m less confident about this than I am most cards. Competition with the Masterpiece could confound the price a bit but I think the insane degree of EDH inclusion, the amount of appeal in Vintage also where people foil their decks the most and the high current price of the Masterpiece all point to this box topper Mana Vault being a strong contender for the $250 to $300 range. I don’t like guessing exact prices, but I think high EDH demand could put this on par with the masterpiece and if there are fewer box toppers, it could surpass it considering how ugly I think the masterpiece is compared with the box topper. If anyone currently using a masterpiece switches, the price on those could dip and make those a nice buy since I expect that price to recover also. The box toppers are selling between $250 and $275 which seems low given the low supply currently and if they get even cheaper when UMA is being opened, the expedition makes a strong case for this staying above $200 in the near term. I like this card a lot and its play in Legacy and Vintage makes this one of the highest-demand cards on this list. Could this end up being one of the most expensive cards once the dust settles? It’s played as a 4-of in Legacy and Modern decks and the high EDH demand make this a real contender. Not having an expedition printing to compete with the box topper is another factor that make this seem like it could crest $300 and beyond. This is one to watch for sure. I’ll be honest, I didn’t expect this card to have quite as much EDH demand as it does but numbers don’t lie. This is currently a $300 box topper and that seems about right – I expect that number to dip but recover. This has moderate EDH demand but I don’t expect a card that’s a 1-of outside of EDH to be worth that much. This is probably going to end up close to $100 if its $50 set foils are any indication. I’m not excited. I don’t think EDH will have to do all of the heavy lifting here. With only one unsold box topper listed on eBay for $225 just sitting there, it’s hard to guess where it will end up, but 4-of formats play this card as much or more than EDH so cross-format appeal will help, which is good, because EDH demand is sort of middling. Almost 100% of this card’s demand is from EDH and while it’s got moderate to high demand, it also has established that EDH demand means it’s a $27 with a mere $64 foil. I think the box topper will be more than $64 but it’s hard to say how much or even whether it should be. See everything I said about Kozilek and throw in the $30 ftv foil on top of it. These can’t all be $100 bills. 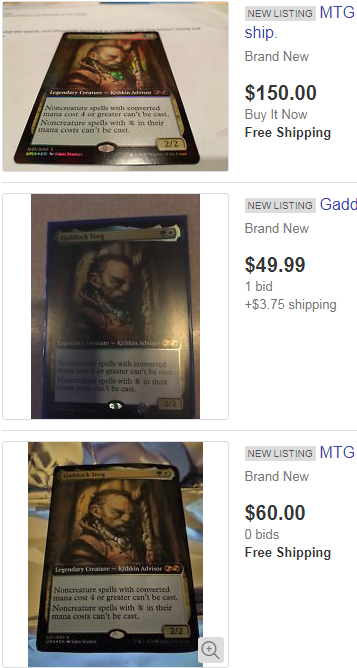 Moderate EDH demand, a recent spike due to how unfair Creeping Chill is in dredge decks and only two of its 3 printings having foil versions make me think the $210 BIN price on eBay isn’t that ambitious after all. Middling EDH demand and 0 demand from other formats all but doom this to sub-$100 territory, which is fine. I would like to own one and I can’t really justify buying myself a $300 card for EDH, but $45? I’m listening. I’m too good at selling expensive cards, which is a good habit to have, I think. This doesn’t even look that good. It’s barely a border extension. I wouldn’t expect this to ever approach $200 but I’ve been wrong before, especially about prices in cards that are mostly used in Modern like this one. Did you expect this to have the most EDH demand of the whole cycle? I didn’t! I expect this to be the 4th-cheapest, however. We’re getting into very low-demand territory here as far as EDH is concerned and Wildwood isn’t played outside of EDH. This is basically a wammy if you open it or Lavaclaw Reaches. EDH isn’t playing this card much and it’s not clear who is. This is one of the better-looking promos and it could just end up in a lot of cubes but $300 is a bit much. The amount of deck inclusions plus the number of decks where Sigarda is the commander still don’t really justify a $200 price tag and this isn’t played enough outside of EDH for me to be enthusiastic about its price. This “feels” $100 to me. I think it goes down at peak supply but I could see this maintaining about $100 on the basis of what we see other masterpiece cards doing, even the ugly ones from Amonkhet block. This will be expensive and EDH won’t have anything to do with it. Good luck getting that $250. I don’t see it. This isn’t played much in cube or EDH and it’s not clear where the demand is coming from. I like this card but I like it a lot less than a lot of other cards on the list and I think a lot of its previous high price was owed to scarcity and how dumb it was in Modern before they banned it. Modern decks could gobble these up 2 or 3 at a time and I see this ending up worth way more than Wildwood which means the EDH demand is the gravy, not the cake. Dumb, flash-in-the-pan Mtggoldfish decks aside, this doesn’t see much play and while it should get played more in EDH, it doesn’t. I can’t get $60 for the Japanese foil version I have, I don’t see someone breaking off $150 for this. This has a $35 Amonkhet invocation. That’s all I have to say about that. A cycle of wammies? Are we sure that’s a good idea? I think $250 is fine-ish for now. I bet this drops when we’re at peak supply but this is in a lot of Modern decks, gets played a playset at a time and doesn’t have as many premium versions as it should. This was a sorely needed reprint and the box topper version is a nice bonus. Not sure what’s going to happen here, but this guy is at the helm of a lot of decks and he needed a premium version. New art would have been cool but I like how this looks. All in all, I would expect this to be around $100. This went from like a solid 3 bills to a $60 judge promo pretty fast. This price is about to crater after UMA packs come out. Luckily Wizards learned and didn’t make a Portal card the marquee card of the set but rather a deep inclusion which means it’s OK when this sheds a ton of value because it doesn’t have to pull the weight they expected Imperial Recruiter to pull. This will be very cheap soon and I bet it goes in a lot of EDH decks when it gets there. This is a bigger wammy than I think people are anticipating. He doesn’t even have a banana in the art. No Potassium? That’s not K with me. I don’t know if this can maintain $100 but it does have quite a bit of demand from a few formats, it gets played in multiples and there are as many of the box toppers as any other box topper, not way more so its rarity matters for other promo versions but not this one. I don’t have much to say about this other than that FedEx bent Jim Casale’s copy of this card and that’s really funny because it didn’t happen to me and they should send him a new one. Modern can’t decide if it wants this card or not and the price is going to dip a lot until it figures it out. There may be opportunity here, though I’m not sure how much. This card is none of our business. We’re getting to cards that EDH doesn’t care about but Modern and Legacy are fond of. If I had to guess, I would say $150 is probably OK but just keep an eye on these. It’s a sideboard card mostly, but it’s an important one. This is an important card for 1 deck in Modern and the 2x foil multiplier lets me know people aren’t inclined to go Premium and I don’t expect this to be much more than the set foil. See what I said about Vengeance and on top of that, there’s a cheap invocation out there. Someone just tweeted at James Chillcott that they sold one of these for $300. I thought that was nuts until I saw this dude out here on eBay trying to get 5. I haven’t played one of these since I was still trying to make Punishing Maverick work in a world that just got Deathrite Shaman added to it. I hope this stays over $100 but the demand has largely evaporated and they waited too long to get us the supply. Snagged a lot of these for $50 on Card Shark and later sold them for $100 so that was cool. Remember Card Shark? Card that warped Legacy and Vintage deserves no less, but it warped EDH a little too much. That’s what I think. I like the cross-format cards a lot more but low on our list are cards like Tarmogoyf and Bitterblossom that will be money regardless of how little EDH cares. I think what emerged was how much I expect Demonic Tutor to go up and how much play Stirring Wildwood gets. That’s all for me this week – until next time!